For 2019 BMW has introduced the X7, its largest ever SUV, which slots above the mid-size X5 and X6 in the brand’s massive crossover lineup. The full-size X7 is designed to comfortably seat up to seven passengers, with a far more hospitable third-row seat than can be had in the X5. Competing head-to-head with the Mercedes-Benz GLS, Lincoln Navigator and Land Rover Range Rover, the X7 carries a starting price of $73,900. As with most vehicles within the full-size luxury SUV class, the starting price is a mere suggestion of what shoppers will actually end up paying. BMW is known for bundling must-have features into available packages or as stand-alone options, so when it comes to keeping the sticker price below $80,000, resistance is futile. Let’s build a well-equipped 2019 X7 and see how many Benjamin’s we owe Bayerische Motoren Werke. Starting in the engine compartment, BMW offers two choices. The X7 xDrive40i features the brand’s buttery smooth inline six-cylinder engine, good for 335-hp and a 0-60 mph time of 5.8 seconds. For those who frequently tow, the V-8 engine available in the X7 xDrive50i will be appealing, but you’ll pay dearly for the rumble of that powerplant and a slightly faster 0-60 time and 121 additional horsepower, as the 50i carries a massive $18,700 price premium over the xDrive40i. Since the six-cylinder provides commendable performance for most driving situations, let’s proceed with the $73,900 X7 xDrive40i. Up next, BMW has shoppers choose between the standard Luxury Design package, which features chrome trim and traditional luxury vehicle styling cues. For an additional $2,900, the M Sport package ditches the shiny bits for a blacked out style and sportier wheels that conveys a “muscular aesthetic”, according to BMW. Overall, the M Sport styling more closely aligns with the brand’s pedigree, and sets the X7 apart from the chromed-out competition, so we’ll proceed with this package, bringing the price up to $76,800. Ca-ching! Disappointingly, BMW only offers five colors for the M Sport version of the X7 xDrive40i, none of which are very exciting. However, classic Alpine White sets off the blacked-out M Sport exterior detailing nicely, so we’ll proceed with this. While the X7 has a number of available wheel sizes and designs, the standard 21″ Double-spoke bi-color orbit grey wheels that come with the M Sport eschew the fussiness of the other options, so we’ll stick with these and incur $0 in additional expenses. To liven up the color palette, Cognac Vernasca Leather gives the X7 some warmth and character and adds $1,450 to the bottom line. Fineline Stripe Brown High-gloss Wood Trim provides a nice accent and is available at no extra cost. Score! Be prepared to make it rain with those dollar bills, we’re up to the Packages stage of BMW’s build process. With no less than seven packages available, ranging in price from $700 up to $3,850 each, this is where BMW makes their coin and shopper’s part way with cold hard cash. The Cold Weather Package comes at a cost of $1,200 and includes heated front and rear seats, a 5-zone automatic climate control system, a heated steering wheel and front armrest. This package is a must-have. The Luxury Seating Package brings 20-way power, ventilated and massaging front seats. At a time when mainstream cars costing tens of thousands of dollars less than the X7 come with some of these features, this is a package without which the X7 would feel incomplete. Comfort comes at a cost, this package will set you back $1,600. While an Off-road Package and Dynamic Handling Package are offered, the X7 will fulfill the majority of its day-to-day duties just fine without them. Let’s skip these and move on. The Parking Assistance Package allows the X7 to be automatically parallel parked, and also includes the capability to remotely view the X7’s surrounding’s when its parked through the BMW Connected App. Finally, that brings us to the $3,000 Premium Package, which according to BMW is comprised of “exclusive features that enhance the premium persona of your BMW”. These include heated and cooled cupholders, remote engine start, soft-close doors, a premium sound system and more. Ready for some decadence? The 2019 BMW X7 offers stand-alone options that include features that really bring the interior ambiance to the next level. Panoramic Sky Lounge LED Roof allows a selection of colors to be projected onto the moonroof, bringing a sense of occasion to nighttime driving. Handmade diamond-cut glass fittings ad elegance to the cabin, allowing the X7 to truly sparkle. To accent the glimmering controls, a leather dashboard adds to the luxurious atmosphere. The total cost for these additions comes out to a $2,600 even. Whip out your credit card, folks! The grand total for this pimped out 2019 BMW X7 xDrive40i with M Sport Design, a total of four package, and three options comes out to a cool $88,345 after destination and handling. That is a $14,445 increase over the base price and brings with it some of BMW’s most luxurious interior fittings and technologies. For comparison, this is about how much a well-equipped Mercedes-Benz GLS, Lincoln Navigator and Land Rover Range Rover will cost. 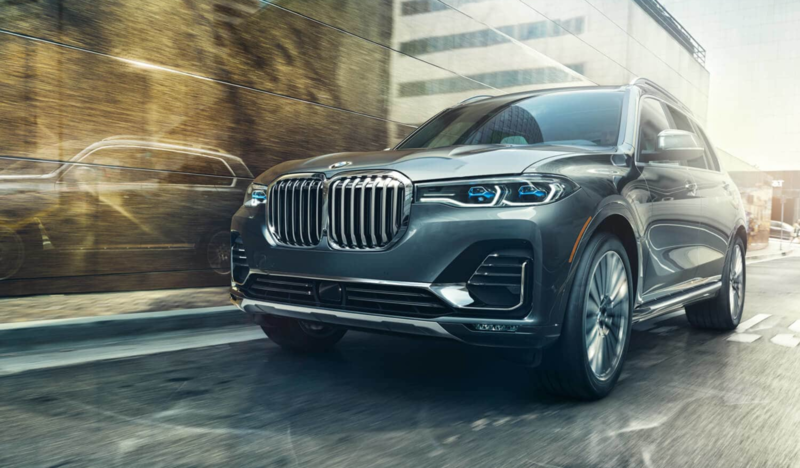 Overall, the BMW X7 is a compelling interpretation of a full-size luxury SUV that offers impressive craftsmanship and a dizzying amount of technology, not to mention bold styling, to set it apart from the crowd.